Situated up in Boulder County in the central part of northern Colorado, Boulder is the 11th biggest city in the Centennial State in terms of population. It’s surrounded by the Rocky Mountains and, like many other cities around Colorado, is located at a high elevation of over 5,000 feet above sea level. It’s a short drive away from the state capital of Denver and has close ties with the city, but also has its own history, attractions, landmarks, and locations of interest for both residents and visitors to enjoy. This city was originally used as a supply base for all the miners working around the Rocky Mountains. Workers in Boulder would create and supply the miners with the tools and equipment they needed down in the mines, but the city grew over the years to incorporate other ideas and industries, so as not to become too reliant on mining. For example, Boulder is the home of the University of Colorado, which began construction way back in the late 1800s and still stands today as one of the top education establishments in the state. Boulder is a great city to visit for people wishing to explore the Rocky Mountains and local natural areas like the Royal Arch Trail, the Mount Sanitas Trail, and Eldorado Canyon State Park. In the city itself, you'll find good shopping malls, the fascinating Museum of Natural History, and plenty of super restaurants and bars to hang out in too. Overall, Boulder is an excellent place to stop off on your travels, and the city is even home to a couple of hostels just waiting to welcome you in and let you stay for some very low prices. Read on to find out more about the best hostels of Boulder, CO. Located in a great spot on the Four Mile Creek just out towards the western side of Boulder, the Boulder Adventure Lodge, also known as A-Lodge to the regular guests, is a great place to spend some time on your next trip to this Colorado city. The Boulder Adventure Lodge is perfect for people wishing to see the natural beauty and scenic surroundings of Boulder, with lots of nice hiking trails right nearby and some stunning natural areas just waiting to be explored. If you want to head into the city itself, Downtown Boulder is only a short drive away. The Boulder Adventure Lodge provides hotel-standard private rooms and rental cabins for its guests, so there's a nice range of accommodation options here. You'll be able to enjoy a tasty free breakfast in the mornings, as well as free Wi-Fi throughout the property. There's an outdoor swimming pool, which is a nice way to cool off in the warm summer months, and the staff at this Boulder hostel and lodge are very friendly too, always happy to help out and share their knowledge of the local area. If you're looking for a clean, safe, comfortable hostel location right in the heart of Boulder, CO, this is the place to be. Basecamp Boulder is located right in the center of the city, only a short walk from key locations like the Pearl Street Mall and the University of Colorado. There are some amazing museums, shops, restaurants, and bars up and down the streets around this Boulder hostel, so you'll never run out of things to do if you choose to spend some time here. Basecamp Boulder is a highly rated hostel with a lot to offer. It's a nice option for families and groups of friends, in particular, with the rooms all coming complete with their own little kitchenettes to help you cook up some treats at any time of day from the comfort and privacy of your own room. There's also an on-site fitness center and an indoor swimming pool, and Wi-Fi is provided to all guests for the full duration of their stay at Basecamp Boulder. There aren't too many hostel options in Boulder itself, but if you don't mind traveling a few miles south and staying the Colorado state capital of Denver, Hostel Fish is waiting to welcome you in. This excellent Colorado hostel has received terrific reviews and ratings from past guests and stands out as an amazing option for people wishing to explore both Denver and Boulder, with local landmarks including the Denver Aquarium, the Mile High Stadium, and the Pepsi Center. 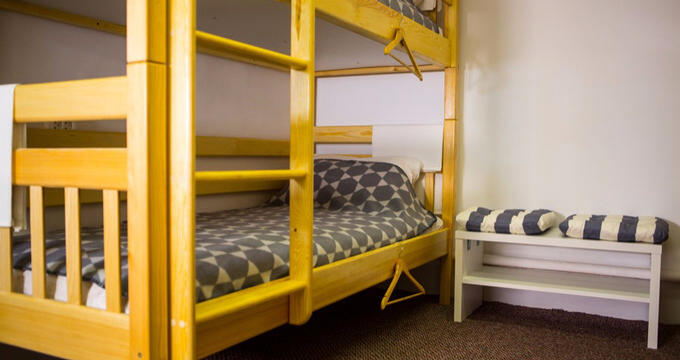 This hostel provides modern, urban-style dorms with industrial-style bunk beds, secure storage lockers, comfortable chairs, and nice decorations all over the walls as well. If you’d prefer not to share, private rooms are also available at a slightly higher rate. You'll also find clean bathrooms, a large lounge space, an on-site bar, coin operated washers and dryers, and free Wi-Fi for everyone.